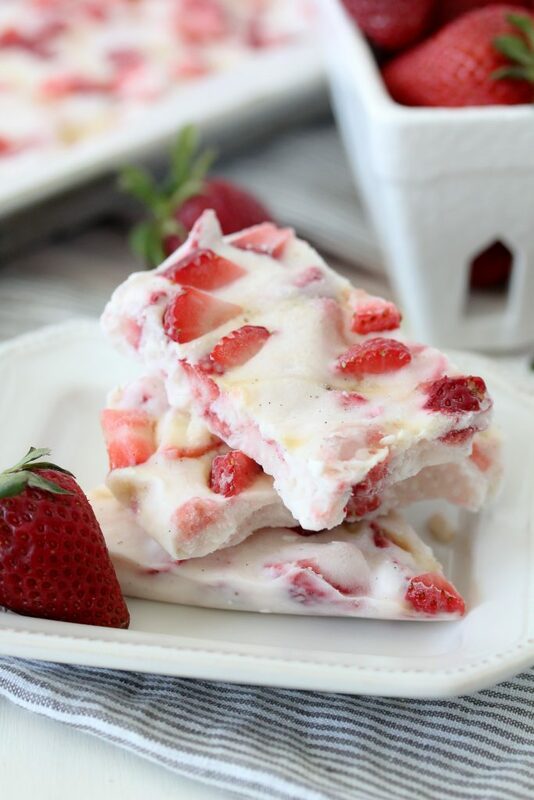 This Frozen Yogurt Strawberry Bark from The Whole Smiths is brought to you in partnership with California Strawberries. It’s the perfect easy-to-make snack for after school, warm days or just because. 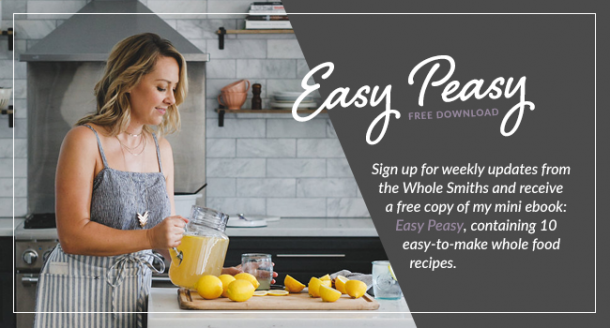 Paleo and dairy-free options! After what has seemed to be like endless days of rain here in “sunny” California, Spring has arrived! And that means strawberry season is in full effect which makes me think of summer which makes me feel like summer has arrived early. How’s that for some linear logic? Ok, fine it’s not quite summer yet but warm(er) days have landed upon us and the grocery stores and farmer’s markets are brimming with an abundance of fresh California Strawberries. In case you didn’t know, strawberry season peaks between April and August and I’m pumped. 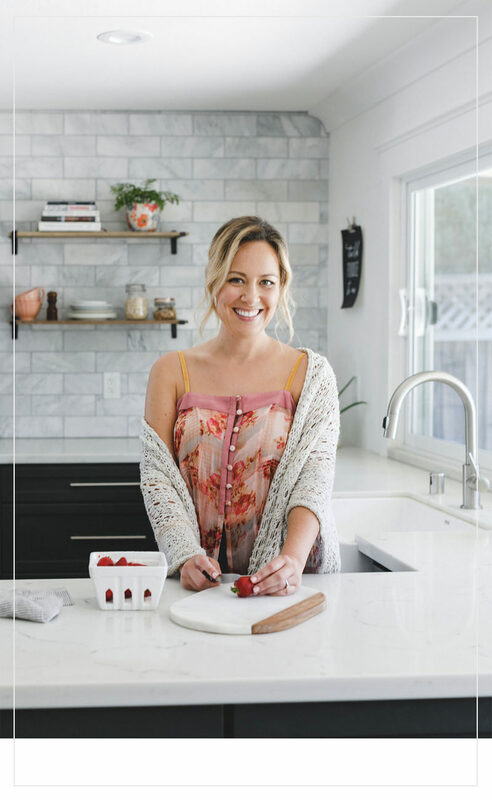 So pumped in fact that I’m going to be partnering with California Strawberries all season long to share easy, healthy and delicious snacks that all include fresh strawberries. Needless to say, this makes not only me, but my kids very happy. I have to say, as a California girl (born, raised, college and beyond) I’ve come to realize how much I take the abundance of agriculture here for granted. I mean, 90% of our entire country’s strawberries are grown right here in California. 90%! That’s a lot of strawberries. And in the case of a zombie apocalypse it makes me even happier to know I’m here in California and will have plenty of strawberries to nosh on. In the meantime, us Californians are happy to share our strawberries with the rest of the world. Strawberries are the hardest things for me to keep on hand here in the Smith house because as soon as I purchase them, they get eaten. Whether it’s with breakfast, at lunch, for an after school snack, dessert, whatever… they’re gone within a day, two max. Which is fine by me because strawberries are loaded with healthy benefits. Not to mention, they’re low in sugar and loaded in anti-oxidants. AND! One serving of 8 strawberries has more Vitamin C in it than an orange. Can someone tell me how oranges ended up getting all of the Vitamin C glory on that? I don’t even like eating regular oranges and I’m pretty sure everyone would rather have a handful of strawberries when they’re under the weather. 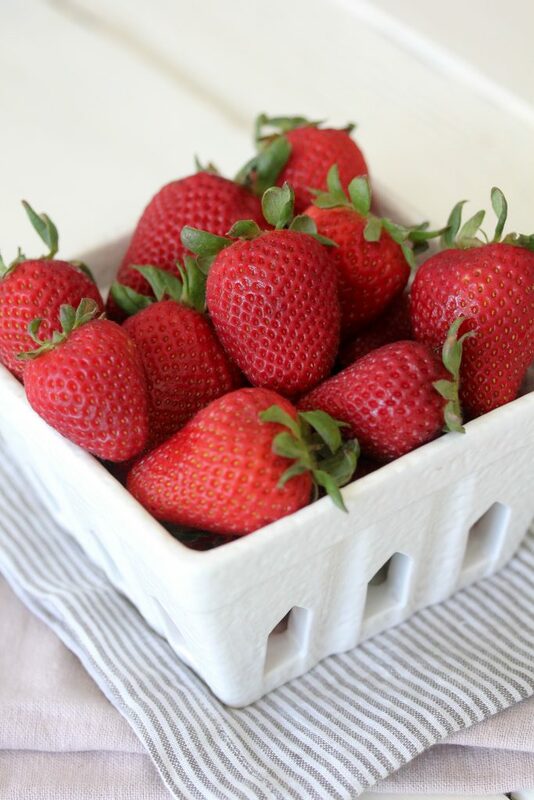 While we typically snack on strawberries right out of their containers we also use fresh strawberries in a ton of recipes. 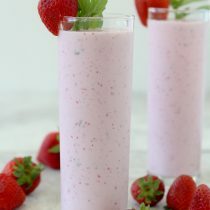 Like my Strawberry + Arugula Salad with Champagne Dressing,Strawberry Coconut Bonbons or my 3-Minute Strawberry Mugcake. I love the flavor of fresh strawberries infused into a refreshing snack. 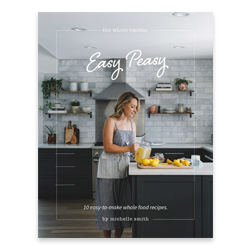 But here’s the deal, you know I’m all about easy, particularly when it comes to creating snacks. 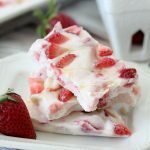 So when I thought about what I wanted to create as the perfect snack to usher in strawberry season, I thought this yogurt bark would be amazing. Not only is it easy to make but it’s fun to make as well. Even the kids were able to help me with it. There’s only a few ingredients and no fancy cooking techniques needed. There’s a bit of flexibility in this recipe to make it your own. As far as the yogurt, I encourage you to use the type of yogurt you typically prefer. This bark works wonderfully with regular cow’s milk yogurt or equally well with paleo dairy-free almond or coconut based yogurts. I also added a bit of coconut butter to the mixture to add a bit of healthy fats in but if you prefer to leave that out or don’t have it on hand, the recipe is just as delicious. Finally, I added a light drizzle of honey over top of the bark for a touch of additional sweetness but feel free to omit it altogether if you’d like. Or, double it up. Make it however you and your family like best. 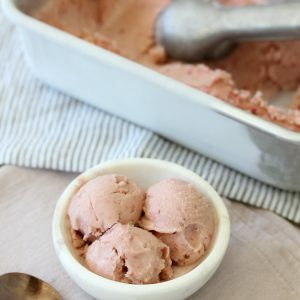 If you’d like to make it an EXTRA special dessert, crumble up a few pieces of graham crackers (gluten-free for me) and mix that in for a strawberry cheesecake-like taste. 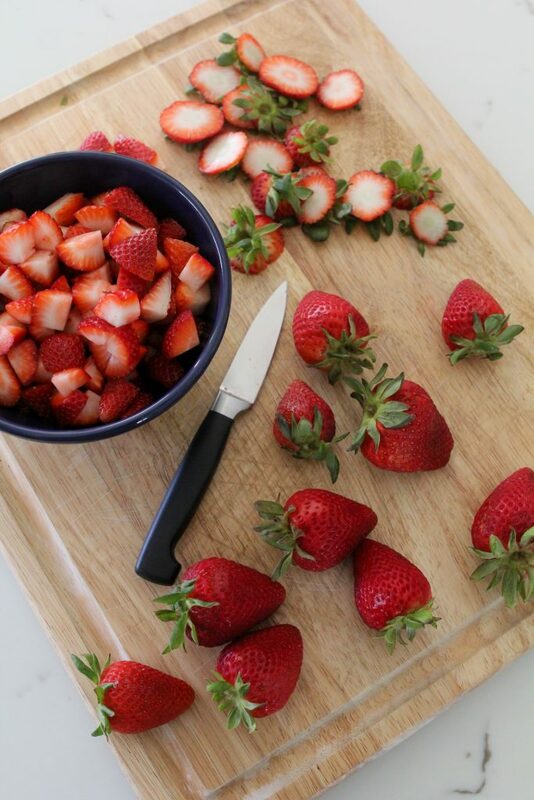 Or feel free to swap in dried strawberries in place of fresh strawberries if you have those on hand. I’m so excited to be sharing all things California Strawberries with you over the coming months. I have a lot in store and promise to make it fun and informative for you. 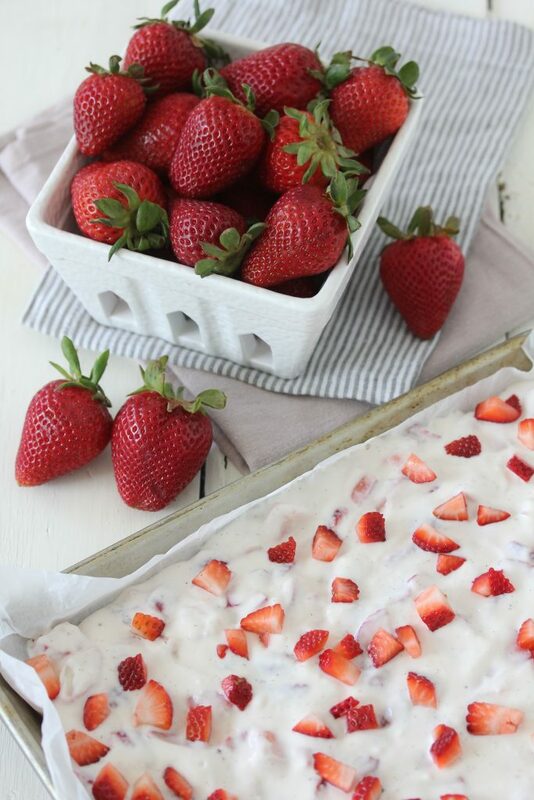 So let’s chat; what’s YOUR favorite way to ring in strawberry season? 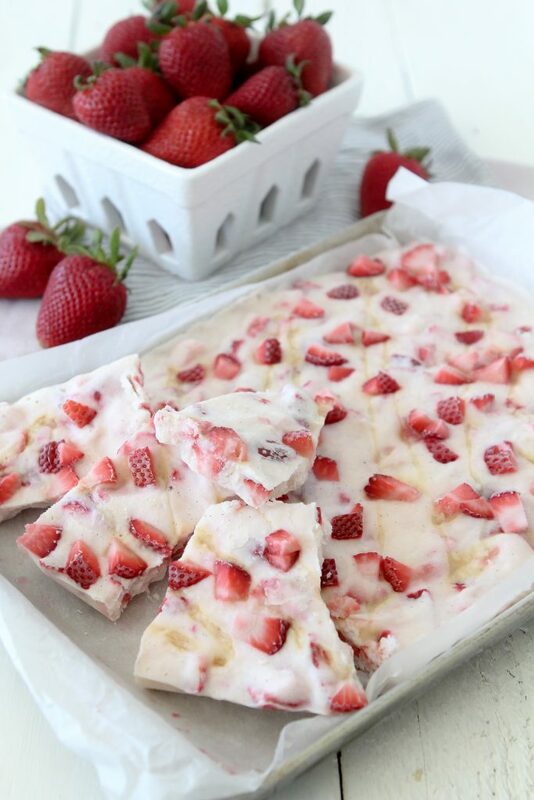 Frozen Strawberry Yogurt Bark from The Whole Smiths. 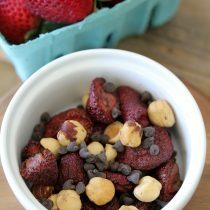 An easy to make snack with a paleo option. Kid and grown-up approved! Line a 9 1/2 x 13 inch rimmed baking sheet with parchment paper. 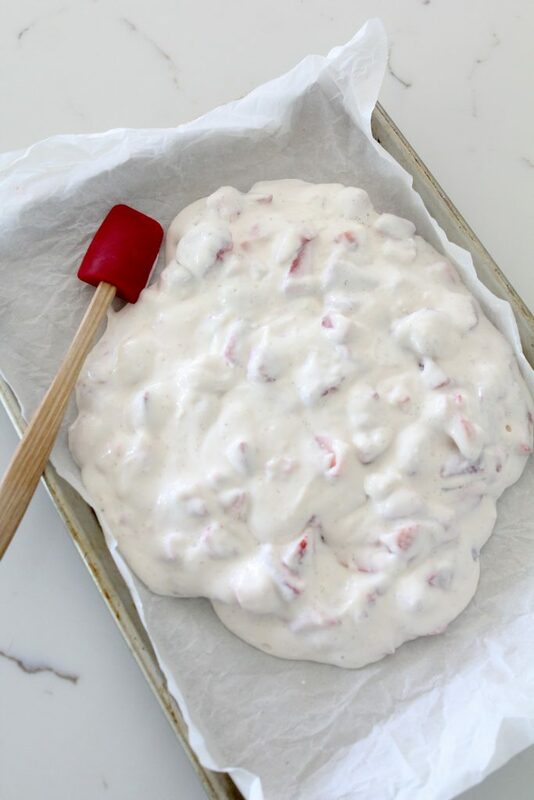 Add 2 cups of the strawberries, yogurt and coconut butter to a large bowl and stir to combine. Pour the mixture onto the baking sheet and spread into an even layer. 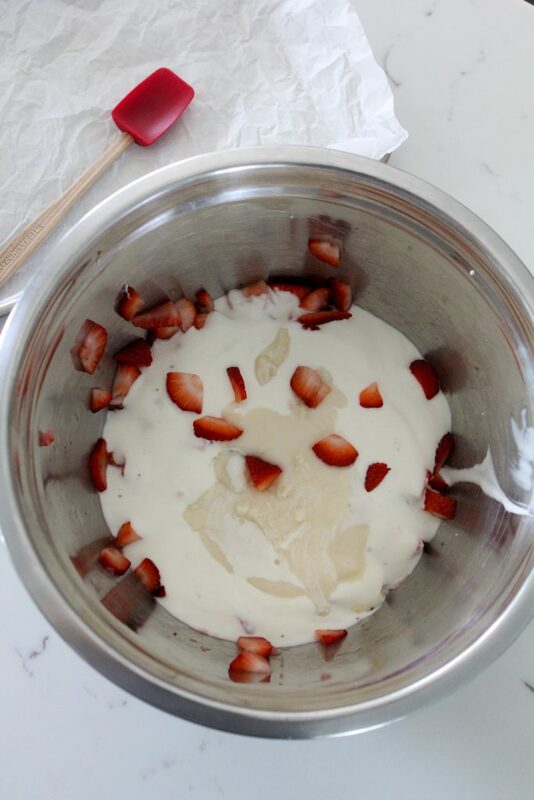 Sprinkle the remaining strawberries on top and drizzle the honey over top and (optional). Freeze for 8 hours minimum. To serve, break apart a piece of the bark and enjoy! This looks fun and summery. Any subs for coconut butter? Never tried it, but I’d rather not buy if I rarely use. I love your FROZEN YOGURT STRAWBERRY BAK but is there a substitute for the coconut butter or i dont really necessarily need it at all?